This week provided me with five days of non-stop Liberating Structures. 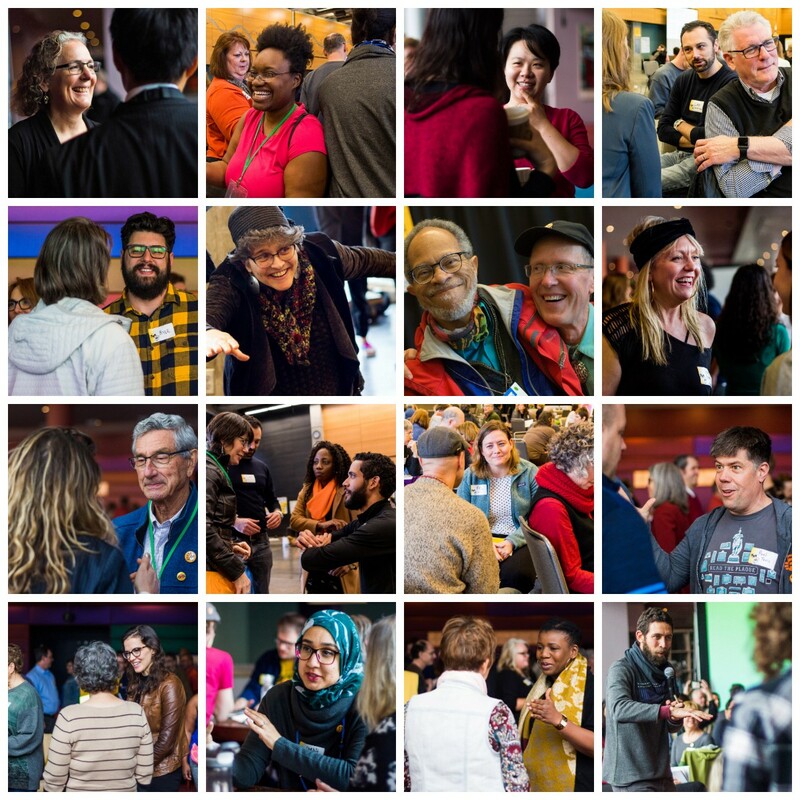 Taking place in Seattle, I participated in a 2-day Liberating Structures Immersion Workshop, followed by a 3-day Global Gathering of around 300 experienced LS practitioners. It was energizing, inspiring and exhausting at the same time, both on a personal and on a professional level. In this post, I share my lessons and discoveries of this week. Before diving deep into the reflection, let me first share some of what happened this week and give you a sense of what it was and looked like. The week started with a 2-day Liberating Structures Immersion Workshop in Seattle by a Design Ensemble of Nancy White, Tim Jaasko-Fisher, Astrid Pruitt & Maggie Chumbley. The workshop was attended by over 100 participants and was mostly intended as an introduction to Liberating Structures. Although it contained few new things for me personally, it was a blast to experience the style of the Design Team, their tight collaboration and the many conversations I had with other participants throughout both days. And each Immersion Workshop does enrich your repertoire by adding new variations and riffs on existing Liberating Structures. 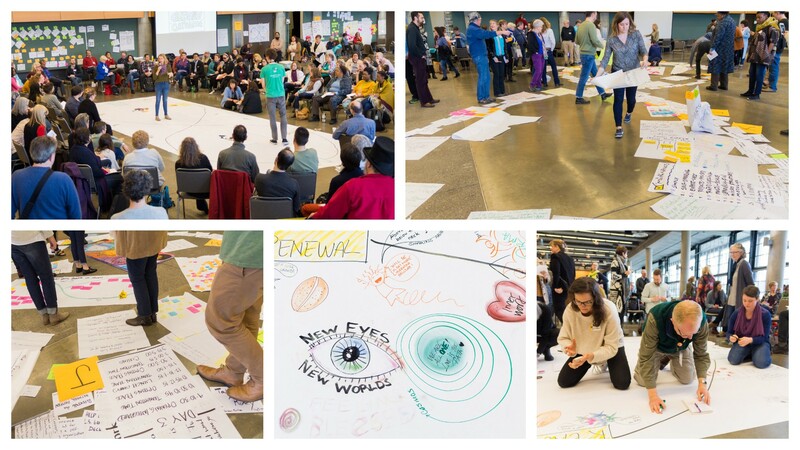 An impression of the Liberating Structures Immersion Workshop @ Seattle. On Wednesday, the Global Gathering started at the Seattle Center. Attended by around 300 participants, including the founders and most of the ‘LS Maestros’ (a term lovingly used for people who have been working LS for a very long time), it was an overwhelming experience. So many familiar faces, so many new ones. Expertly organized by Fisher Qua and Anna Jackson, the Global Gathering was designed with the purpose of growing our community and to advance our (shared) skills as practitioners. With an incredibly diverse group of participants from all walks of life and levels of experience, the design consisted of an Options Space (a slightly more structured Open Space) interspersed with 1 to 1.5-hour “integration tracks” facilitated by design ensembles of experienced practitioners. This meant that there was a good balance between working with the entire group (300 people) and smaller participant-driven sessions. The pictures give you some impression of the sheer scale of this event and serve as a dramatic showcase of how easily Liberating Structures can be scaled up to massive groups without losing individual voices. During the Gathering, I visited a session by Heidi Helfand on Liberating Structures within the context of Agile. I also had the pleasure of hosting a session with Julie Huffaker from Deeper Funner Change on how to deal with tension and conflict in teams (more in a separate post). Another session I facilitated was with Henri Lipmanowicz on how to build a business case for Liberating Structures. Finally, together with Amanda Bowman and Nancy White, I had the opportunity (and huge responsibility) to close the Global Gathering with the final Integration track. Although not a new insight, the Global Gathering reaffirmed how Liberating Structures are a facilitation language. By this, I mean that the structures themselves become the words that facilitators use to build sentences, together (strings in LS-terminology). As the language becomes more natural, it becomes progressively easier to improvise on the spot because you both have an understanding of what things like ‘Impromptu Networking’ and ‘1–2–4-ALL’ mean. A wonderful example of this was the 90-minute session that I facilitated on team conflict with Julie Huffaker. With little time to prepare, we created a string of four structures in under 3 minutes and visualized it on the wall. We used the string to gather observations about how you know there is tension (1–2–4-ALL), explore what fears, worries, and anxieties this evokes in us as facilitators (Tiny Demons), explore how experienced facilitators deal with this (UX Fishbowl) and identify next steps for ourselves now that we know this (15% Solutions). We found that this string worked really well with our group of about 30 participants, created a powerful conversation and allowed people to find personal next steps. Another example was a session where the string emerged during part of the conversation. It started with an introduction round, followed by a 25/10 Crowd Sourcing to gather topics for further exploration and a UX Fishbowl to dive deeper into some of them. Because no-one else had facilitated one before, I jumped in to help. It was interesting to see the different designs used for the sessions in the Options Space. Some people used a string of Liberating Structures while others didn’t. I noticed that sessions with a string worked better because they engaged their audience in more varied ways. Sessions without a string tended to turn into ongoing group discussions or presentations - two ways to structure interaction that are rarely effective at engaging and involving an audience. I participated in one session where involvement notably increased when Liberating Structures were introduced after a traditional round of introductions (with 15 people) - which the facilitator cleverly pointed out at the end. A good example of their power. Even at a Global Gathering of experienced practitioners, it was a bit surprising to see sessions that didn’t use them. In part, this may have to do with the ad-hoc nature of many of the sessions. With little time to prepare, we often default to less structured interactions. This feel less scary and risky. And preparing a string does take time. Selecting a couple of structures to chain together is one step of the work, creating strong invitations is another. And some practice here is definitely helpful to feel at least slightly comfortable. Still, I strongly believe that even a Liberating Structure that is facilitated mechanically beats a group conversation or a presentation any day in terms of engagement. One inspiring story involved a participant who tried his first Liberating Structure during a successful session that he facilitated. I love these stories. They show that you don’t need the experience to structure interaction in a better way. Especially when we also create an environment where it is safe to fail. This was quite apparent in another session I attended where participants worked together to decide which structure would make the most sense considering where their conversation was at that moment. Everyone was supportive of attempts and there was no judgment when it didn’t work out, only encouragement. This is the kind of environment we need. Interaction in groups is messy, especially when solving complex problems — lets embrace that. Interaction in groups is messy , especially when solving complex problems — lets embrace that. I had the pleasure of co-facilitating with many different LS practitioners over the course of the Global Gathering. One recurring discovery here was that despite greatly varying styles, the use of the clear language and principles of Liberating Structures allowed us to quickly find our groove and start playing off of each other in a “Yes, and”-style. I loved facilitating with Amanda Bowman, who has a remarkable ability to create gently provoking invitations. This was different from Henri Lipmanowicz’s more direct and no-nonsense approach. Julie Huffaker’s style was more a mix of this, with a very calm, playful and warm touch. Despite these differences, Liberating Structures offered a framework with ques and moments to switch, shift to another structure or add more depth. One thing I love about my work with Barry Overeem is that we co-facilitate so frequently that we have become highly aware of each other (and admitedly, sometimes not). Over time, we have developed a subtle non-verbal language to signal each other about when to move on, when to go deeper or when to ‘whisper out loud’. We have also found a good way to visualize strings for participants, to distribute the facilitation and to improvise on the spot. During the Global Gathering, I found that these learnings generalized to other facilitators - and that was an awesome discovery. It also made me appreciate even more the work that I do with Barry, and how valuable it is to have someone to constantly sharpen your skills against. One of the reasons for joining both the Immersion Workshop and the Global Gathering was to enrich my repertoire of Liberating Structures. I have experience with over 25 structures (including some structures that are ‘in development’). It’s easy to run another Impromptu Networking at the start of an event. But what else is possible? I’ve captured the variations in our freely accessible Facilitation Toolbox on Trello. We love using Liberating Structures in our work for what they make possible. More so than other things we’ve tried, they seem to be able to change entire systems be introducing or shifting the rules of how individuals interact. This is the nature of complex systems; change some of the rules, even for a subset of the whole system, and the entire systems can begin to shift. Interestingly, our Professional Scrum Master II-class features a lot of Liberating Structures. One question we often get is to introduce concepts around ‘Systems Thinking’. We never fully realized that a lot of this is already there, but is never called out as such. And more explicitly, many Liberating Structures purposefully deal with the system, its rules and the varying levels of relatedness going up and down. Like ‘Min Specs’ or ‘Panarchy’. The lesson for me here is that, once again, there is so much more going on beneath the surface of Liberating Structures. You can approach it merely as a set of facilitation tools, but if thats the angle you’re going to miss out on so much more powerful stuff. One specific insight was offered by Karen Dawson from Deeper Funner Change. She shared with us insights from neuroscience and antropology that show how priming activities (such as some energizers) can help dampen our innate need for status and to impose power hierarchies onto groups. They suspend this need in groups and allow for deeper interaction. One example of that was ‘Back to back, face to face’ where rapidly rotating pairs of individuals quickly turn back to back and face to face while responding to prompts. Not only was this a lot of fun, it invited deeper connections to be made. It made me reconsider my love-hate relationship with energizers, finding a purpose for them that goes beyond merely ‘energizing’ a bored group of participants. I’ve captured a number of priming activities in our freely accessible Facilitation Toolbox on Trello. All-in-all, I struggled a bit to manage my own energy and found myself skipping sessions or integration tracks altogether. Sometimes I just needed to withdraw into a corner and answer some emails to shut myself off from all the interaction. I hope I didn’t offend people with this or gave them the impression that I didn’t want to catch up. It was simply a bit much at times. Impressions of the closing of the Global Gathering (pictures by Lisanne Lentink). But what an amazing closing it was. We worked together with Fisher and Anna to create a visually powerful metaphor for what had happened these past days. It started out with a huge Ecocycle Planning that Amanda and I created on the floor. We invited participants to write down their personal reflections in response to a number of prompts and then asked them to draw them somewhere on the Ecocycle using whatever language (visual or otherwise) they preferred. In itself, this was a powerful moment. But it wasn’t over. Fisher Qua and Anna Jackson joined in to introduce the concept of Panarchy. What the participants had just been doing was the ‘micro’-level — individual reflections and learnings. But these insights together formed what we had learned and generated as a community over these past days. So while people were drawing the Ecocycle, we gathered the many materials we had generated (flips, topic cards, stickies, posters, paintings) and spread them out into another Ecocycle elsewhere in the room. This represented the ‘molar’-level of the Panarchy — the broader community. Once introduced, we invited participants to silently walk around the second Ecocycle and reflect on it. Meanwhile, we showed a pictureshow of pictures taken by Lisanne Lentink and a song created by Kevin Joyce on day one. Then we moved to the third stage of the Ecocycle; the ‘macro’-level. Keith McCandless and Fisher Qua welcomed participants into a future 50 years from now where Liberating Structures are common place. Workplaces are no longer de-humanizing and mechnical and where people are not longer wasting their time in pointless meetings. In small groups, we explored what had made this success possible. How had this Global Gathering contributed to that? What happened afterwards? We ended in a large circle where I facilitated a Social Network Webbing with prompts like ‘Walk to the person that said or did something you are grateful for’ and ‘Walk to the person that you are going to approach for consultation and help in your journey with LS’. It was another powerful way to visualize the networks of this community. We ended with a cheer, followed by applause. I loved every moment of it. I loved how we recognized and visualized our learning. I loved how we recalled the materials created during the gathering. And I loved how we recognized the legacy already created by Keith McCandless and Henri Lipmanowicz. And I loved that we — meaning Amanda, Fisher, Anna, Keith and Henri — pulled of a complex and layered set of structures (Ecocycle, Drawing Together, Panarchy and Future~Present). Keith McCandless and Henri Lipmanowicz are the founders of Liberating Structures. They have collected, invented, curated and improve upon existing ideas to form an evolving set of Liberating Structures. With this Global Gathering being the first large one, it was a powerful reminder of the legacy they are creating. Although both Keith and Henri are exceptionally humble and rather unwilling to receive praise for their work, the Global Gathering was certainly a celebration of that work. And rightfully so. I am humbled and glad for having discovered this wonderful, growing community of people that are all driven by one purpose; to deepen the connections we make with others — both in our work and outside. It might be tempting to understand Liberating Structures merely as ‘facilitation tools’, but this does no justice to the depth and richness of what is made possible by them. On a more personal note, it helped me recognize how much I have already learned about Liberating Structures. It also showed me how much I can still learn about them, and about engaging groups in general. And I am amazed by the many new people I’ve met and the opportunities that will certainly emerge from that. This is my heartfelt ‘Thank you!’ for everyone who made this possible. If you want to know more about Liberating Structures, check out the official website. Or join one of the many user groups out there to explore Liberating Structures. Or Immersion Workshops taking place throughout the world.